The Bakugan Evil Twin packs are another set of exclusive Bakugan products only found at Target. The packs only feature three of the season 3 Bakugan --- Helix Dragonoid, Dharak, and Coredem --- along with their evil twin, or the "balancing" or "opposite" or "neutral" twin. All the evil twin packs contain 2 Bakugan (the normal Bakugan and the evil twin), 2 Ability Cards, and 2 Metal Gate Cards. 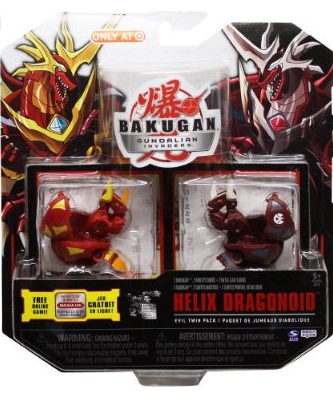 The Helix Dragonoid Evil Twin pack contains the normal Helix Dragonoid bakugan and its evil twin. The twin has a darker color, a crimson and pearl bakugan, with white horns instead of yellow, and dark grey paint for the yellow patches on the body. What is interesting is that in the anime episode where the evil twins appear, Drago had already evolved into Lumino Dragonoid and no longer Helix Dragonoid. 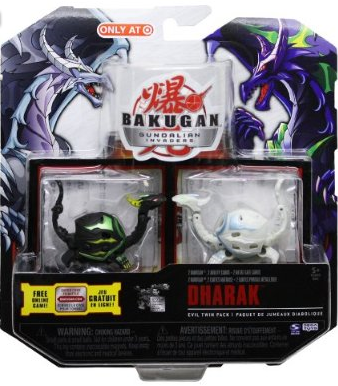 The Dharak Evil Twin pack is the odd one of the three packs, mostly because the normal Dharak is already an evil Bakugan. This would mean that his "evil" twin is actually it's good twin, or in this case let's say it's "balance" or "neutral" twin. Even the picture on the package makes this obvious, with the good Bakugan always on the left side of he picture. The pearl Dharak, which is the normal Dharak's evil twin, is on the left side implying it is the good Dharak. The Coredem Evil Twin pack contains the normal Coredem and its evil twin, who was shown in the anime series together with an evil Lumino Dragonoid. 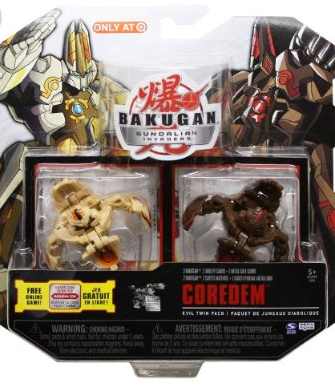 The evil Coredem has a darker shade of brown color, with red markings instead of the usual orange for Subterra Bakugan. In their battle against Zenet and Contestir, Dan and Drago had to deal with illusions of an evil Lumino Dragonoid, and then an evil Coredem. They were able to see through the illusion and won the battle in the end. Purchase Bakugan Evil Twin Packs Below.